The effortless juxtaposition of old school charm with cool hip hop as illustrated by the “Rap Pack”– Jay Z, T.I., Kayne West and, of course, M.I.A. at this year’s Grammy’s was the influence behind this week’s outfit. 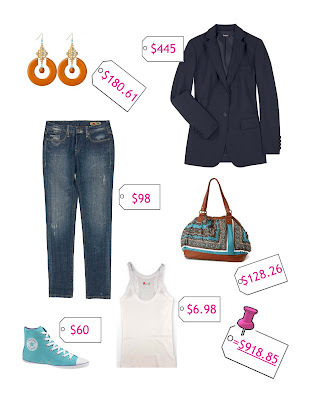 The orange and teal colour combo of the graffiti found on a wall in Spain is edgy yet fresh and is reflected in the pairing of All Stars high-tops, white tank and boyfriend jeans with earrings and bag found at Anthropologie; the blazer lends further polish to an otherwise understated look.